If you’re hungry try the Recipes page. If you’re thinking about selling wild mushrooms, read the article on Food Safety Certification Training. For foray leaders you will want to review the checklist. Although this article is from Debra Shankland of the Ohio Mushroom Society it is very similar to Minnesota’s situation. Exceptions include that in MN, State Parks prohibit Chaga collection. National Forest areas have a “personal on-site use” limit. Always check the websites for areas you want to visit for collection allowances. MushroomExpert Lots of understandable information about fungi, how to study them, and identification keys that you can use to ID your mushrooms. The Forager Chef Wonderful recipes and how-to from Minneapolis based chef. MMS Newcomer Packet Great information on how to describe fungi. Minnesota Mycological Society Good programs and identification at meetings and on forays usually within two hours of the twin cities. North American Mycological Association (NAMA) Great annual forays (Cable, WI in September 2017! ), educational materials, speakers bureau, and mushroom poisoning experts. They also have an extensive list of books and other resources. Wisconsin Mycological Society Activities are mostly around the Milwaukee area, but they have a big foray in Hiles, north central Wisconsin each year. Northstate Mycological Club in the Minoqua, WI area. Illinois Mycological Society Pat Leacock and Michael Kuo are members. Michigan Mushroom Hunters Club also does a foray in the UP and on Isle Royale! Out-of-state membership is inexpensive. Hoosier Mushroom Society with Steve Russel heading up the mycoflora project. Mycological Society of Toronto hosts an annual foray in Algonquin Park and meets on the grounds of the Toronto Botanical Society. They record speakers and make it available through their website. Ohio Mushroom Society where Walt Sturgeon hangs out. Lake Erie on the north and Appalachia south. Kuo, Michael and Andrew Methven, Mushrooms of the Midwest, University of Illinois Press, 2014. 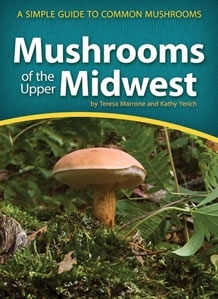 Teresa Marrone and Kathy Yerich, Mushrooms of the Upper Midwest: A Simple Guide to Common Mushrooms, Adventure Publications, 2014. If you know anyone who has had an unfortunate experience eating wild mushrooms this season, including pets, I encourage you to file an online poison report. NAMA collects these reports, and reports from its web of emergency mushroom identifiers, into an extensive database of mushroom poisonings through the decades. Be safe. If in doubt, throw it out! If you have an article you would like to share with the club and others, please submit it in plain text (.txt) format below.